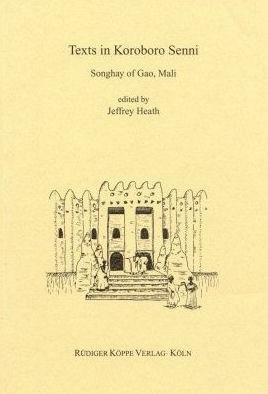 Koroboro Senni is the Songhay language spoken in the city of Gao (northern Mali), the capital of the Songhay Empire of the late Middle Ages. The language extends along the Niger River, west to Bamba and east to the border with the Republic of Niger. The major dialectal differences involve the Bamba area in the west versus the mainstream dialect (from the Gao area to the border). The volume contains 216 pages of texts from the mainstream dialect, most of the speakers having lived in Gao but having origins in villages to the east. Bamba is represented by 66 pages of texts, enough to bring out the grammatical particularities of this variety. The texts are all dialogues, including free conversation, travel narratives, and legends, in all cases with substantial speaker-audience interaction. The originals and English translations are on facing pages, and there are extensive footnotes on grammatical and cultural points. This volume can be used in conjunction with a reference grammar (also published by Rüdiger Köppe Verlag), and a Koroboro Senni-English-French dictionary (Éditions de l’Harmattan, Paris).